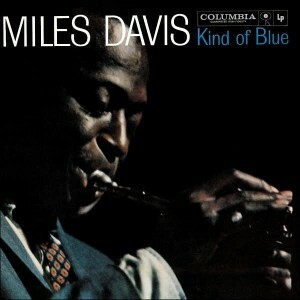 Kind of Blue is a seminal jazz album by Miles Davis. The original release consisted of 5 songs that where improvised in the recording studio but with restrictions on what scales each musician could use to shape how they played. This influential yet unorthodox technique laid the foundations for the modal jazz subgenre and became synonymous with it. Miles Davis collaborated with other high profile musicians from the era, some of whom he had worked with before or where longstanding bandmates. This included Julian “Cannonball” Adderley (alto saxophone), Paul Chambers (double bass), Jimmy Cobb (drums), John Coltrane (tenor saxophone) and Bill Evens on piano for all tracks except Freddie Freeloader, on which the role was taken up by Wynton Kelly. There are some noticeable recording problems on Kind of Blue. The trumpet bursts with hissing feedback during the build-up on So What and instruments only come through one speaker (saxophone and piano on the left and drums and bass on the right). This feedback issue only seems to be at the start of So What whereas stereo sound is abused throughout Kind of Blue. The spontaneous approach Miles Davis selected (apparently only hours before going into the studio) along with the emphasis on music theory pushes Kind of Blue into a corner in terms of who the album will appeal to. It is most likely going to be jazz enthusiasts or those with a working knowledge of music theory. The latter of which is required to “get” the music as the theory behind it (which was first written about by pianist George Russell in 1953) is in fact the focal point and the reason for it being regarded as a cornerstone of jazz music. For the rest of us it is the equivalent of throwing buckets of paint at a wall and expecting to pick out well defined shapes and patterns.